Just to the side of the Cathedral facade in C/Santa Lucia, the 12th- to 14th-century Casa de l’Ardiaca (of the Archdeacon) is home to a municipal archive. 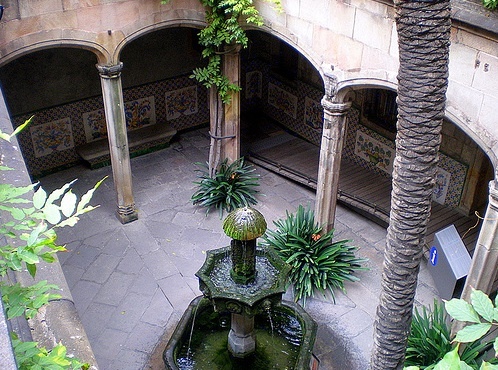 In 1902, when the palace was owned by the lawyers’ college, Domènech i Montaner was called upon to create the charming tiled courtyard draped in wisteria, with its lofty palm and pretty Gothic fountain. Domènech also gave the building Barcelona's most famous and beautiful mail slot. The architect refused to damage the ancient door, but built a Modernista slot on the side with swallows and a tortoise that expressed his opinion of lawyers – swallows, he explained, with wings to soar into the realms of truth, the tortoise plodding along at the pace of court procedures. Opposite is the Romanesque Capella de Santa Llúcia (1268), founded by Bishop Arnau de Gurb, whose tomb is within. Long, straight C/ del Bisbe Irurita separates the Casa de l’Ardiaca from the medieval Palau Episcopal, the bishops’ palace, built on the Roman wall. It’s off limits, but you can look into the elegant Romanesque courtyard with its pretty arcade, another work of Bishop Gurb. Just across from this palace is the Baroque church of Sant Sever. Like the cathedral, this church was protected from Anarchists by armed guards during the Civil War, and it is one of the few to preserve its frothy Baroque interior, with an altar in a trompe l’œil setting by Jeroni Escarabatxeres. Just behind it, in the charming Plaça Sant Felip Neri is Barcelona's shoe museum, the Museu de Calçat. Just to the north of the Cathedral, a Thursday flea market takes place in this little square, which also hosts the Christmas market, where discriminating shoppers can find the finest array of caganers. Plaça Nova’s Collegi d’Arquitectes (1962) is a poor ad for the architectural trade, but its otherwise dreary façade is decorated by a sketchy frieze of popular celebrations (including the giants who feature in so many local festivals) by Picasso – his only piece of public art in Barcelona. Inside, there’s a bookshop, a good restaurant and temporary exhibition galleries. Opposite are two Roman towers, renovated in the 12th century, that guarded Barcelona’s northeastern gate. In front of this, an arch of the Roman aqueduct was reconstructed in 1958. Don't miss the other Roman treasure hidden away on the other side of the Cathedral: the Temple of Augustus.